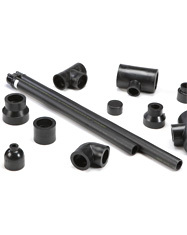 CB Supplies offers high quality fittings‬ intended for use in geothermal applications in conjunction with geothermal pipe produced by CB Supplies. These fittings are made from high-density polyethylene resin and are intended for high pressure field applications. They can be easily joined through socket heat fusion techniques with proven and guaranteed performance. The fittings have natural chemical corrosion resistance built-in and also offer UV protection of up to 5 years if left in outdoor and exposed environments.